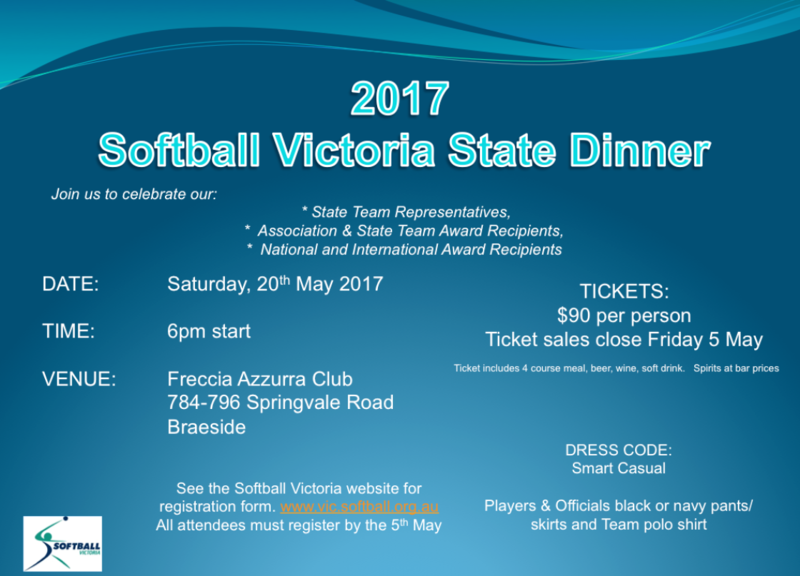 Home / Featured News / LAST CHANCE: Secure your tickets to the Softball Victoria State Dinner! LAST CHANCE: Secure your tickets to the Softball Victoria State Dinner! Softball Victoria would like to remind its members that registrations for the 2017 Softball Victoria State Dinner close tomorrow. Join us at the Freccia Azzuro Club in Braeside from 6pm on Saturday May 20 to celebrate the achievements of our state team representatives, association and state team award recipients and national and international award recipients. Tickets for the 2017 Softball Victoria State Dinner are $90, which includes a four course meal, beer, wine and soft drink (spirits at bar prices). The registration form for the event can be found here, which must be completed by Friday May 5. For more information, refer to the event flyer here.